View of the west entrance to Ely Cathedral in Cambridgeshire. A Saxon Minster was founded here and rebuilt after the Norman Conquest. In 1109 Ely was made a Bishopric's see. Its status as a monastic cathedral allowed it to escape destruction in the 1530s when its monastery was dissolved. 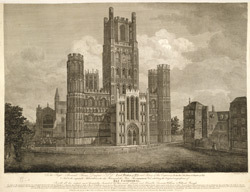 This print shows the 13th century Galilee entrance porch, the Norman west tower, and both side wings either side of the west tower. To the right is St Catharine's Chapel and to the left is no longer standing after it collapsed.